I know, I know. These articles are supposed to run every other Saturday, but, when I was writing the last one, I came upon so many cool non-American releases that I knew I would have to write some extra posts. One of the albums I came across was Escapism Path by Sangam, from the United Kingdom. I was intrigued by the cover and the short amount of ambient musick I heard. The cover to Escapism Path is pretty cool. I like those cool blue lights of the skyscrapers of the city. It's a bit frightening too. That large form lurks straight ahead. What is it? I see black orbs, and perhaps a large aircraft of some sort. As a cinematic, ambient album it works well to have something that really draws on the viewer's imagination like this. Escapism Path by Sangam Escapism Path starts with a track of the same name coaxing the listener into this world. Rain falls as synths rise into a skyscape of lights amidst darkness. There's a lot of floating about, too much exposition. "Mineral" begins with the sounds of the street. Then, the tones of crystals appear and are soon joined by beats from a beat machine. Dramatic pauses create tension. 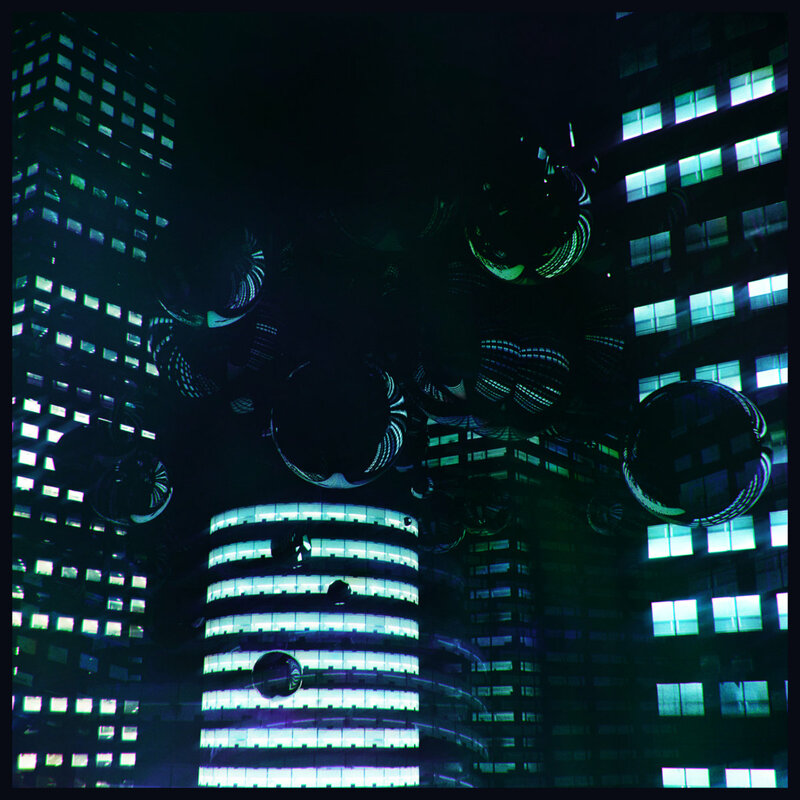 "Felt Blue" has more street sounds, more like an alien city of the future somewhere in the sky. Sad tones turn brighter. There are many strings. "Break Down And Cry" didn't make me sad at all, though I can see the scene in my mind. I feel more of a sense of understanding, a solemnity from this, but I can see this in a film with someone walking through dark alleys sullenly into a moment just like the track is called. The sounds are very full here with huge sweeps. "Merely A Phantom" ends the first half. It's more of the same, though there is also more of a melody here. I think the constant rain static, extensive reverb, and wet organ soars really throws it off. The second half starts off with "So We Say". It sounds a little different, but these pulsing glows are still under the constant wash of rain. It kind of just loops. Rain continues into "Lost Way", which has a spooky whine of a ghost in the fog. The synths are a little harsh here, but I do like this one more than the others. Nearing the end, "Then We Don't" introduces more rain. The musick is nice too. There's not much to say about it really though. "Ancient Plains" sounds the part, and there is a lot more here than most of the rest. I really like the different sounds being used, especially the clearer lead part. The song has a more earthy and, well, ancient sound to it. There's nothing wet here. "Wish Things Were" is decent with more found sounds and interesting, breathy synths. Despite my initial interest, I don't find Escapism Path to be that interesting. The majority of the tracks are very, very similar instrumental sweeping wet synths and rain and city sounds going on and on seemingly formlessly. It's certainly not a bad release, but I really don't get much from it. I like that a few of the song have beats or are just way different overall, like "Ancient Plains". I understand that there is a concept here, a cyberpunk/noir theme and all, but more can be done than just the same rain-drenched city drains all the time. Escapism Path gets a Neutral.